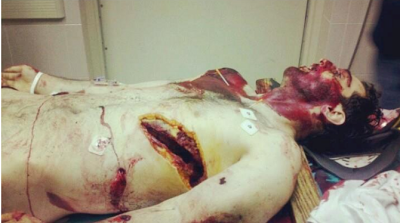 Mass Shootings & Paul is Dead & other things: Who is the man on death row in Boston for the Marathon Bombing fiasco? Who is the man on death row in Boston for the Marathon Bombing fiasco? Did Dzhokhar Tsarnaev survive his time in hospital? Most unusual -- though excused by people who are saying these were "monsters" instead of accused criminals -- there have been no photos of the man in court: no mugshot from early days, no other photos. If there is a double, to appease the public, after an accidental death or revenge murder or, if the Boston Marathon bomb(s) event was a falseflag fraud then as a murder when Dzhokhar's testimony would become way too inconvenient in a court, and yet a public lynching in modern times, a kangaroo court with duped (incredulous) lawyers and so on would still be needed, and in either case then another Russian, a prisoner or someone else, would be arraigned for the supposed crimes and is now sentenced to death row. But is there evidence not only of a lack of ordinary photographic history of the accused outside of the courtroom, but also of an actual series of injuries which do not fit the state of the accused in court, or, more damning even, is there direct evidence toward replacement and death? 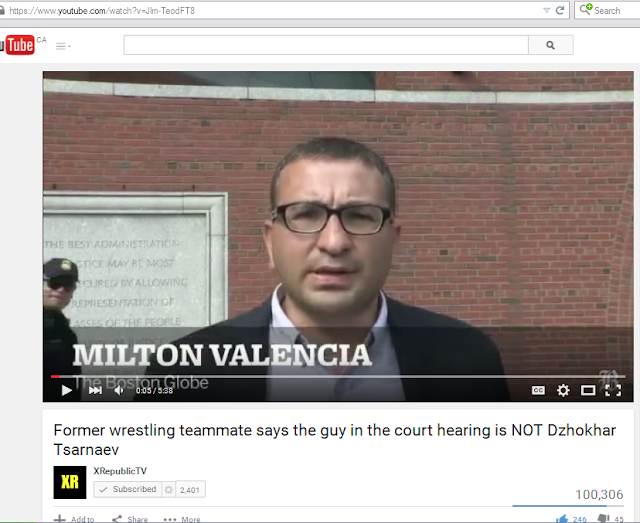 The man in court first appeared a bit puffy on one side (his left), as if hit ("a blow"), said one news reporter (see video linked about a wrestling teammate's comments to the Boston Globe TV news, below in article, about 3/4 of the way through this blog post you are reading). He also had no serious movement problems or impediments with his head, but had a broken arm. 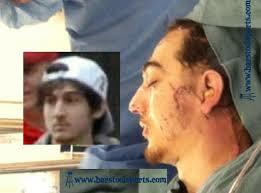 Dzhokhar had been very seriously injured at some point, according to his doctor, as we will discuss below. It may have been only what we saw him injured with when he emerged from the boat, the night of the bomb event, or there may have been more to it. This will be part of our discussion below, but for the moment, let us point out that even months later, a puffy face and broken arm do not suit the injuries Dzhokhar had sustained. He would have more serious speech and pain impediments, at least, and even if he had recovered from those mostly, we will find there is strong suggestion that his injuries had been far worse than those best-case scenario symptoms. So for the moment, about the man in the court, if he was not Dzhokhar but was beaten up in prison, including a blow to the left side of his face, to give a superficial similarity to the fact that Dzhokhar had a very serious problem with his left side, and if the man in court was told he would not come to real harm even if he got the death penalty, would he do it? Probably yes. Let us not wonder further for the moment about the man who may not be Dzhokhar, and instead learn whether he is not Dzhokhar. Those who have studied the Boston Marathon bombing and found evidence of fraudulence in the whole event -- every area of it, and the best interview on this, I think, is here: https://www.youtube.com/watch?v=xA3H69tKEzE&index=67&list=PLsfS5KpYMzb20sCxyfSotfX1ELkIBrXZ3 -- will be perhaps still surprised that a) the court did not agree (but they were not allowed to consider some basic information) and b) that Dzhokhar was not on trial. 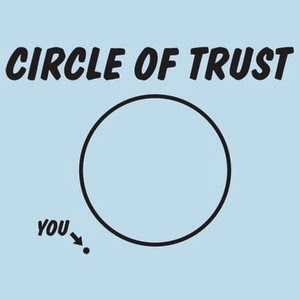 That link I just gave is an attorney discussing the flaws of the trial and the lawyer. However, the topic of this post is much more contained than the broad argument about the Boston event and focuses only on one aspect of the trial of a man called Dzhokhar. It is on the identity of that man. Of course, it is *not* okay to cry out that there are doubles or faking of any kind, without evidence pointing that way. We will, in this article, witness that there are three main areas of evidence, with some tight reasoning, that Dzhokhar on trial may not be Dzhokhar the person who was accused originally of the crime. The Doctor (in once-suppressed, now released) testimony spoke of a "serious" gun blast to Dzhokhar's upper neck, a fracturing of the base of skull, and the side face blown. (Doctor downplays this a bit by saying "lower face" but it was side, at jaw level, according to the next piece of evidence). He's not asked to draw diagrams or explain. He also is cut off from giving more details. He does conflate (combine) the timing of giving Dzhokhar treatment and drugs with the condition of the face, but he could well be aware he should lie a bit, or he might be mixing timelines which were a bit overlapped, from an original injury and a later complication and death. We also must note here that though a fracturing of the base of the skull can sometimes be survivable (depending on the size and location of the fracture or fractures), there would be long-term pain, troubles moving or speaking or hearing. None of this is in evidence in anything said by or drawn from the man in court later. He arrived with face swollen (which can come from a beating) and was a bit stiff in early days. That's all. 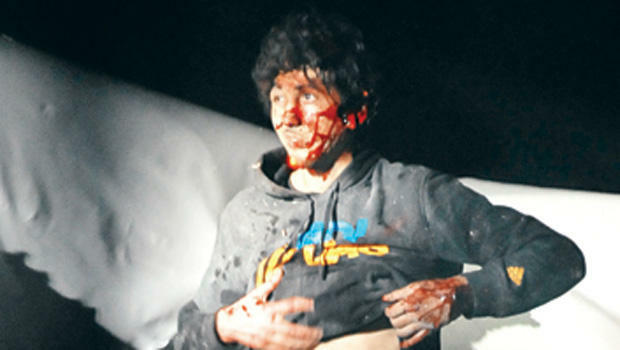 The leaked photo of Dzhokhar with professional medical personnel around him, on a slab, has same-brown (not bruise) -- putty -- on the whole lower side of his face, through his ear, and a shiny slight depression in one area, suggesting it is not doctored brown colour on the photo itself ("Photoshopping). There is also something strange going up under the skin or bracing the area of his neck. The body has earplugs as well, not usually kindly given to people in surgery -- though it is occasionally done. One time ear inserts are used is for surgery inducing literal death but under controlled circumstances, where there is a good chance of revivifying the patient: it is called hypothermic cardiac arrest. The brain is deprived of blood, after inserting molded speakers into the ears (to give 100-decibel clicks to block out sounds and allow a monitoring of the brainstem), and drugs and cooling have affected the body. This can be done for some brain aneurysm and head wounds, where all blood must be received outside the body to allow surgeons to work with no blood, making artificial cooling and drugging and breathing necessary. "The patient's eyes were taped shut and molded speakers were inserted into her ears to emit 100-decibel clicks and block out any other auditory stimulation. After she was fully anesthetized, the neurosurgeon opened her scalp, cut the skull open with a special pneumatic saw, and opened the dura mater to expose the brain. On the other hand, nothing like this was actually reported for Dzokhar's surgical treatments and if it was done, the other aspects of the photo argue against that reason for the earplugs. 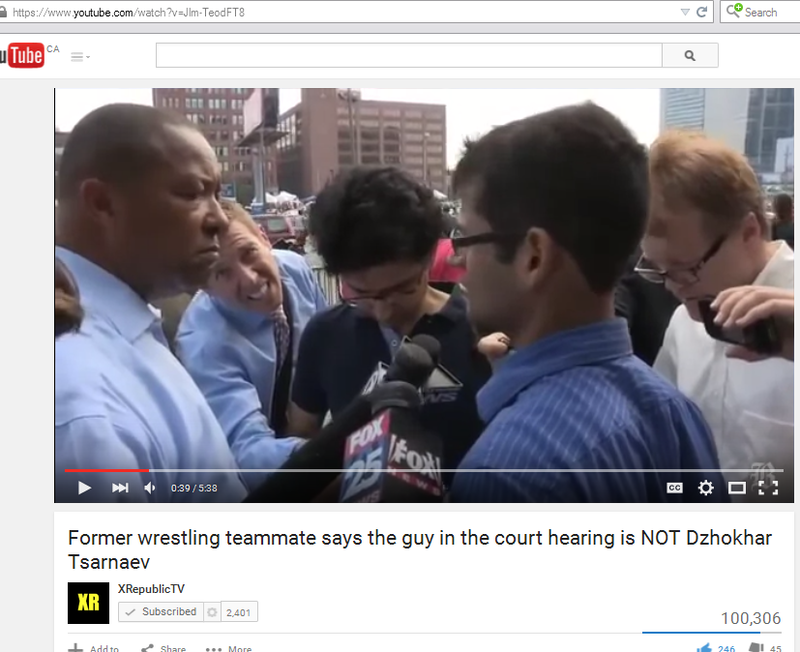 Yet this young man in the photo, who is clearly Dzokhar, has a concavity along the jawline and the same odd simple pinkish tone from that point all the way to the back and bottom of his neck. What affected his whole neck and lower ear? There is no breathing assistance on him, and for someone in this condition, it is hardly likely that he is alive, given what we will learn next, for context. For the pink areas to be bruising, why is there an edge to it along the area of the jaw, as if the area was depressed, and why is the whole neck sutured in such a weird way, with a whole area discoloured the same as the jawline, while blurred out a bit (perhaps to hide just how much this has to be an embalming), and why the earplugs? Also, what is that long, straight bulge along his neck, with a curve near the shoulder and going right up behind his ear? Is it a tube under the skin? Not likely. Is it a rod? It is not a suture. Is it a rod to stabilize the putty for an embalming shape on a reconstructed neck and jawline and lower ear? Maybe so. Bruising, also, is brownish, blackish or pink and uneven. But first, about photos, we must note, along with this photo evidence above, that Dzhokhar's face is dragging on the left side from some injury to head or neck, in a different photo, from the night of the event of the "bombing". It is possible he did shoot himself or was knifed or shot. But the doctor expressed a different level of injury, it seems. Even if Dzhokhar only had this injury and this photo's dark spot is not doctored ("Photoshopped") for public release after a much serious blast later had caused him to die, we have to note that Dzhokhar could have died in hospital from the injury. The injury above was later claimed as a self-inflicted gunshot wound, in photos of him getting out of the boat he was hiding in. There is more to the story of his being in the boat, the perfect -- planted -- document in the boat, and how Dzhokhar might have gotten his injury at all, but for now we note that his lower face is not blown and he can indeed move. In the final photos, he is rushed to hospital, seemingly in worse condition than he was in, for blood is pouring into his breathing apparatus collar, in the ambulance. If he was attacked further by police in angry retribution -- uncalled-for, actually -- or if he really is still in the same condition but the blood is just smeared more in the last photos, we cannot directly know. But we do have the later photo of him on a slab and the doctor's evidence which are interpretable as his having died by a side-back blowout to his lower head and jaw. Now what about that knife wound? Who knifed him? Did that cause more injury and lead to his death? Was it shrapnel? Anyway, the doctor who was interviewed in court (and interrupted), and whose testimony was sealed until much later, described caring for Dzhokhar, which may be quite true. But then, if he died, there was another shot (a murder shot) later, while he was in care, or he succumbed to his injuries or was killed by drugs. Those are the options, of course, if there was a death. Now let us see if there is anything else supporting the problematic photo of him with the whole neck and jaw injured and earplugs, and the fact that the doctor described wounds which would normally combine to much worse condition later than the man in court has displayed. Yes, there was time between the bomb events and the court dates, but as we have covered above, the severity of what the doctor describes would normally be much damage to the man, for life, if he survived, and the photo indicates a whole neck and back of jaw missing or shattered. Now, the wrestling teammate in this article you are reading is not the more famous Ibragim Todashev. He had died (murdered) about a month after the Boston fiasco. 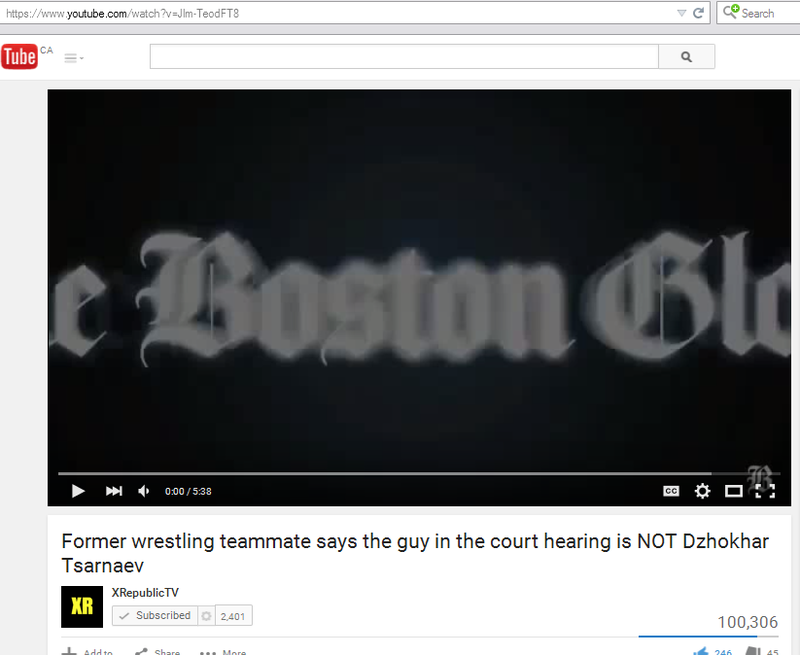 The audio is here at the link, and three screen captures of the video, which is a Boston Globe news broadcast from TV, is below it. The Boston Globe was part of a disinformation campaign, but contrary reports do sneak through such things, with reporters scrambling for interviews unsuspecting a larger and more hidden cover-up. Would Dzhokhar's family know? Of course. Too many people are -- ahem -- silly enough to say that. With two sons lost, would they lie and be warned? Yes. But would a friend be missed, not warned, not put in the loop? Very likely. You are not in that loop and he was not. Before rushing to think the teammate would be lying or confused, we have to compare it to the other two areas of evidence: the doctor and the photo. We also have to understand that the teammate would have less reason to lie and get himself killed if he were not bursting out in surety that this was "Not ... not ..." his friend. But what happens? He doesn't finish his sentence: he gives three areas of the man in court's not being like his friend. The only reasonable interpretation of teammate's statements -- even if he were wrong -- is that he is realizing that if it is not Dzhokhar, there are bigger threats than going to court going on, and he curbs himself a bit, even as he squeaks out, so to speak, his confusion at what he's sure is not his mate. As to another of Dzhokhar's teammates, Ibragim Todashev, a was dead soon after the events of the bomb in Boston. Ibragim Todashev, a petty criminal but good friend of Dzhokhar was seemingly executed by FBI ambush interrogators (again, another story, but worth noting the details of, because though the killer of Todashev got some kind of headwound, seemingly from Todashev, it may well have been as the killer actually attempted to kill Todashev, not the other way around, with Todashev the first attacker or a real threat to a man with a gun). There are no pictures of the double (the man on death row), not only inside court but in any initial mug shot. That people have been saying that's "okay" because they "don't want to see such a horrible man" is moot. Normal coverage would show you the accused. Photos now, too, would not be worth much: with age, people can over-excuse a double. Only a natural looking, young and recovered mugshot would do. Warped or much-later photos will not do. Of course, one can still tell a double or doctoring of photos under these conditions, but fewer people will understand or want to wade through the arguments. So let's say: why is there no mugshot of Dzhokhar, from some years ago? Exactly. He did not survive to that point. 1. Doctor's statements reviewed, 2. pictures reviewed, 3. unnamed teammate's statements reviewed. 1. Doc, 2. pics, 3. teammate. Justice for the dead can extend to people who were criminals in life, or partly bad people, or to people who were purely patsies of someone else's crime. These young men seem to have been at least petty criminals and part of a CIA-connected family, an anti-Russian campaign (not that Russia is a pure nation, but terrorism has been known to be supported against it, from the outside). But that all three, not two, died by murder for a falseflag bombing, probably unknown to the actor participants in general, at least at first, is now likely. RIP to Tamerlan and Dzhokhar "Jahar" Tsarnaev and Ibragim Todashev. Not that they were perfect, they deserve what justice would be theirs, even if they had bombed people, which they did not -- but that is not the argument for this post.